Charles de la Bedoyere came from a Breton family. In 1806 he entered the army as a Second Lieutenant. He was aide-de-camp to Marshal Lannes and prince Eugène and his career took him to Italy, Germany and Russia. In France he received the Légio d'honneur. When Napoleon returned from Elba he was at Grenoble with his regiment and immediately joined the emperor. At Waterloo he was Lieutenant-General and he was probably the one who a message to D'Erlon who was about to join Ney at Quatre Bras that he should turn east to help Napoleon at Ligny. Ney called them back and d'Érlon's 20.000 men didn't fire a shot that day, thus allowing the allied forces to escape. During the battle of Waterloo he was aide-de-camp to Napoleon and was among the last to leave the battlefield. On 23 Jun 1815 he pleaded at the Chambre de pairs for succession by Napoleon II, until Masséna, who presided, cut him short with the words 'young man, you forget yourself'. Soon afterwards it became clear that he would receive no amnesty, but he delayed his flight from France because he wanted to see his wiofe and his son one more time. He was recognized, arrested, tried and sentenced to death. He was executed at the Place de Grenelle. 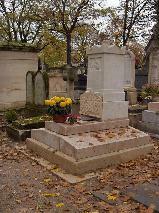 His grave at Père Lachaise was a place of pilgrimage during the restoration. The grave of Charles de la Bedoyere at Père Lachaise, Paris.